"The Church Moved by the Hand of God"
The history of the church "moved by the Hand of God" in Swan Quarter, North Carolina, is impressive and unique. In fact, the phenonenal event is considered one of God's miracles. In 1874, members of the Methodist faith in Swan Quarter decided it was time to establish a permanent church building and abandon the temporary place where they had been holding services. The location of the church became a matter of concern. Benjamin Griffin Credle, leader and promoter, and his committee picked out a perfect site for a church in the heart of town on its highest spot. They approached the owner of the lot, Sam Sadler, one-time clerk of Hyde County Superior Court, regarding the purchase of the land. Mr. Sadler would not sell it. The Methodists then accepted a gift of a lot offered by James W. Hayes, some thousand feet in rear of the present courthouse, and in a short time began building operations. When the church, a modest structure on brick piers, was barely shut in, people began to worship in it. At that time it was the Methodist Episcopal Church South. In September 1876 a fateful event took place. The story is told in an affidavit given by Mrs. Lelia Brinn, an eyewitness, to P.G. Gallop in 1939. Mrs. Brinn was born and reared in Swan Quarter and lived into the 1950's. Mr. Gallop was superintendent of Hyde County schools from 1935-1941 and president of the first Hyde County Chamber of Commerce. September 16, 1876, on the eve of the dedication of the church, a storm broke out and began to brew. Rain fell and wind blew until on the morning of September 17, 1876, the wind had reached such a height and the tide had risen to such depth that the force of the water moved the little Methodist Church from its temporary location into the road--now called Oyster Creek Road. A miracle was happening--the church was floating down the road. It went straight down the road to a corner and bumped into a general store owned by George V. Credle. The corner is now Oyster Creek Road and U.S. 264 Business. Then a curious thing happened! The building took a sharp right turn and headed down that road for about two city blocks until it reached the corner of what is now Church Street. Then it moved slightly off its straightline course, took another turn to the left, crossed the Carawan Canal directly in front of the place where the people desired the church to be, and settled exactly in the center of the Sam Sadler property, the site which had been refused. After seeing the mighty work of Providence and realizing there was a mightier power than man ruling the universe, Mr. Sadler set about to secure the title for the land. When the church was dedicated years later, it was called "Providence". In 1912-1913, the present church was built to replace that notable building. The old church was sold to a private owner for use as a barn. But God had other plans for the scared ediface--the old church. It would never compete with the grandeur and the eloquence of some of the larger churches, but a memorial shrine for future worship. After the death of the late Mr. and Mrs. W.T. 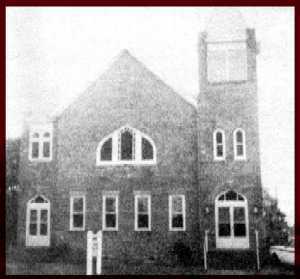 Berry in the early 1940's, the church was purchased by their daughters, Mrs. Lucy Berry Langston and Mrs. Pearl Berry Smith and presented as a memorial to the trustees of the Providence United Methodist Church and is now know as the Berry Memorial Building. The old church stands on the same hallowed ground as purchased for its first location. This building was renovated under the supervision of the late Rev. R.Z. Newton. The former sanctuary was divided into a fellowship hall and Sunday School classrooms. A modern equipped kitchen and two restrooms were added.